it is true… i skipped a whole chapter. about three weeks ago andrea and i left Santiago, Chile for the west coast… Valparaiso. it was once an important port city. the port is still in use but the city has feels more like a retreat from Santiago. It is older and has more character than the resort beach cities to the north. i will leave you to the Wiki explaination of its history because it is very interesting and caught my attention when i first thought of moving to South America. before Buenos Aires we had planned to live here. anyway. valparaiso is a special place. a short bus ride from Santiago. we followed directions to our little hostel in Cerro Alegre (happy hill). the buses are easy. the “collectivos” are shared cabs. the city undulates over dramatic hills. 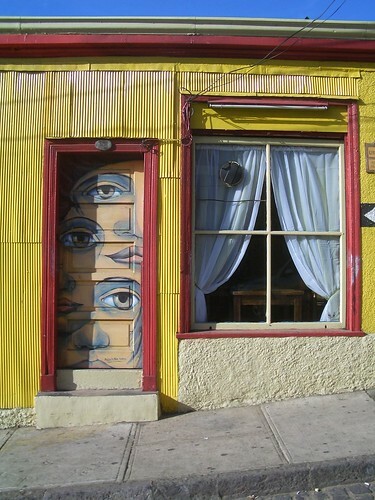 Cerro Alegre is a popular one for tourism, with colorful murals, cafes, and boutiques. we spent 4 or 5 quiet days there over Easter weekend. the hostel was delightful. a young couple had opened it 5 months earlier. they had an interesting story. the bar they owned and lived in in Santiago burned down and they didn`t have insurance. needing money quick they took bar jobs on a cruise ship. a heartless job as the ocean is without law and no one looks out for you. after two years they tried to start an avocado farm but couldn`t afford to dig the holes to plant the trees. they moved to Valpo and were going to open another bar. they anxiously waited 3 weeks for the agreement on a place to go through and on the day they were finally going to sign they saw this house and bought it instead. they are very happy with the change in their lives. they have a 3 year old daughter (Sophie’s birthday is TODAY!) and a friendly rabbit ( named dulce de leche) that licks your toes while you hang your laundry to dry. Matias and Constantina are both painters. Constantina is writing a screen play for a movie based on a story a traveler told them. the city provides funding to artists if you can show progress. what a concept. it is apparent that there is a lot of support for the arts in the city. SO. andrea and i just walked the streets and enjoyed the dramatic vistas, colorful architecture of buildings perched on hillsides. we visited Neruda’s second home. we found ourselves in the port where there was a lot of commotion as hawkers competed to fill their boats with riders. not knowing where the boats went we picked one and learned that it was a tour around the coast, in spanish. saw a giant sea lion lounging on the nose of a boat. nada mas. very laid back couple ‘o days. andrea left me there and returned to BA. i returned to Santiago on my own. my second stay in Santiago was drawn out cause i had to wait till monday for a bus north. i think i stayed 5 or 6 nights. one day i did nothing. tried to save money by stocking up groceries instead of eating out, though the restaurant options in Chile are WONDERFUL! i rode my bike, visited a winery (Concho y Torro), visited the precolombian artifacts museum, and the ZOO! i had been hearing strange noises from the roof deck of my hostel and now i know why. the zoo is set on the mountainside about the city and was great. i felt like a kid there. the animals all looked healthy and were active so it was not a depressing visit (except that fathers couldn`t restrain themselves from amusing their children by feeding the animals. that was hard to stand by and watch.) the zoo is also home to a lot of rescued animals. i saw animals i had never heard of. and all the animals were really close, so i realized just how big a lion or polar bear are. they are HUGE! so are ostriches. i enjoyed the giant aviary the most. a rainbow of colorful birds in a mountain forest setting. i have to mention that the hostel this time around was horrible. it had been one of the best i`d stayed in and this time there were some very inconsiderate travelers staying there. some young english bros… such a shame. the first night back though i met a friend who was heading to Brazil. fun to talk about the trip he was preparing for. then i got on a bus to Lima.